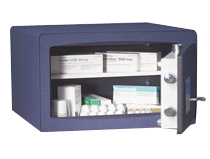 Rosengrens RS offers many different alternatives for secure and convenient storage of theft-prone objects and documents. 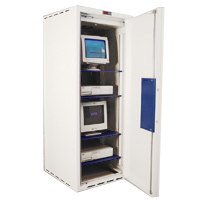 The safes are suitable for storing documents, AV-equipment, portable computers, tools, tobaccos weapons and ammunition. All versions have the cash safe as a base but the concepts are different in order to correspond to various needs. We develop unique solutions such as lockable working station, storage of drawings, apparatus in operation, theft-protected exposure and key storage. The safes are tested and certified according to Swedish norm, SS 3492. RS is available in 6 different sizes, from 45 to 695 litres, where one is specially designed for storage of keys. Rosengrens Baltic are compact cash safes designed for daily use in smaller shops, hotels, apartments, offices and for residential use. Being compact and discreet they are easily hidden away for added protection. Baltic is available in 7 different sizes, from 10 to 79 litres. 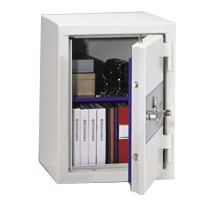 The safes are of solid construction with concealed hinges and a good bolt work to resist burglary attacks. The standard lock is a key lock, with the added benefit of being key retaining. This means the safe must be locked before the key can be removed from the door, thus preventing the mistake of leaving the safe unlocked. Electronic locking is available as an option. Rosengrens CoolIT protects your computers from both burglary and dust. One of the most common reasons for computer crashes is dust. CoolIT offers a virtually dust free environment thanks to its filters.The safes are available in 5 sizes, 71-707 litres, and three different levels of ventilation for all sizes. All models have a plug-and-socket connection and a cable intake system enables easy connection through the side of the cabinet. 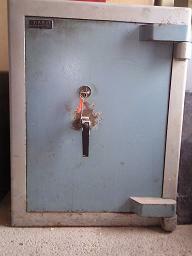 The standard safe is equipped with Rosengrens key lock RKL 10, but combination or electronic lock is available as an option. CoolIT can be fitted with adjustable, extensible shelves and special shelf for key board and mouse into rack bars.